Camera Raw convertion, crop, clone, curves, levels, Nik software, NoiseNinja and USM in PS CS4. That's quite a face. I love the outfit. Fantastic portrait. Captured the personality of the subject extremely well. Has a great vintage feel to it. In my top ten of the challenge. 9. Lol. 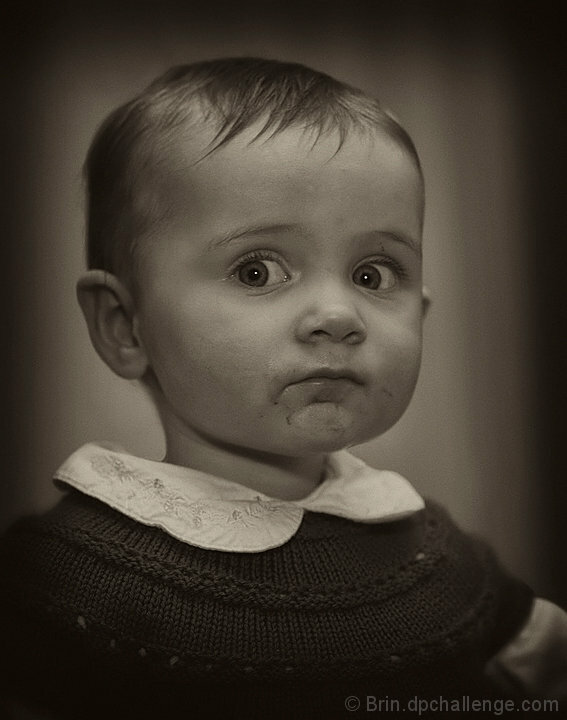 The stare from this wee one is great, and I enjoy the vignette. I'm not usually a fan of young child portraits, but I enjoy the expression here. This is a cute portrait with the classic editing style and expression I am sure the photographer and parent/s are extremely happy. However me, being an outside viewer with no emotional attachment I would say it is not a strong enough piece. it is nice, don't get me wrong the vinaigrette and radial blur are nice for this type of image and the forward flash even works. Just for me it is not enough. A little face wipe before the shoot or some cloning would help this otherwise lovely, old timey portrait. Proudly hosted by Sargasso Networks. Current Server Time: 04/20/2019 06:17:42 PM EDT.